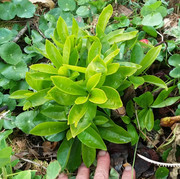 i have a few seedlings which i have never identified. 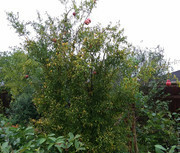 Tropical Fruit Discussion / Pomegranate - can i hard-prune to graft ? i have a couple of POM i grew from seed. and while sweet and fairly tasty, the juice-sac is rather small. 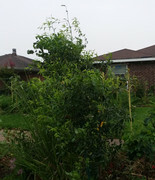 the other tree is taller, 12ft + and doesnt produce at all. 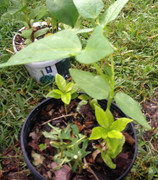 both are seedlings from "wonderful" variety. 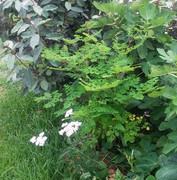 i have a cutting grown out to about 3ft which i think is Parafinaka. 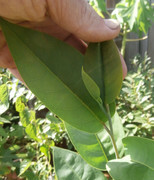 i am wondering if i can take 2 cuttings from it and graft them to the large tree ? and how hard can i top-work it ? also, should i graft them in Spring ? and if anyone has a couple of cuttings from a tasty soft-seeded variety, i would appreciate it. 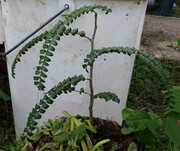 Tropical Fruit Discussion / ID seedling ?? old soil and no tags. can anyone ID them ?? and ive added fertilizer, iron, magnesium, and fish emulsion. and the leaves have started curling under. but, lots of stuff are back from the roots. Tropical Fruit Discussion / WHere to buy White sapote fruit (to be shipped) ? New Orleans had a once in 100yrs record breakinhg cold snap in January this year. its taken a while to find out what is actually coming back and what is not. 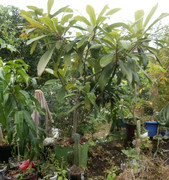 it was so cold, Cattley Guavas died to the ground. 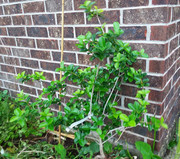 1 protected, grafted (1yr old) died. 1 in-ground 4yrs old - died. 1 7gal container, 2 yrs, coming back from roots. white sapot - died to roots, coming back. Longan - in-ground (1yr) dead. plectranthus esculentus (African potato mint) - back from roots, unharmed. neem (1gal container) back from roots. one in-ground , back from roots. 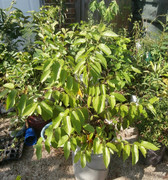 Indian Jujube 2yr old in container - dead. 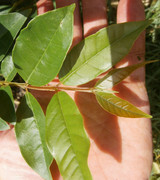 Indian Jujube 1yr old, in ground - coming back from roots. Anyone know where i can get a Schizandra ? i had ordered one from Logges last year. and it finally kicked the container. otherwise you need a male and female plant. I am willing to get both if need be. Tropical Fruit Discussion / CORG 20F and Front yard permaculture setup. and i have peanut and strawberries as ground cover around it. the peanut is a nitrogen fixer. it died to the roots, but started coming back also. and killed damn near everything, at least to the ground. 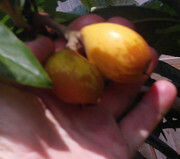 Tropical Fruit Discussion / Loquat - when is it ripe ? 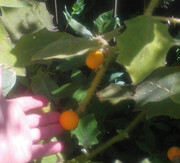 This is the first year my loquat has fruit. a few of them have split, maybe 10%. i am guessing it got too much water. the flavor is a bit muted from what i remember them tasting like as a kid. i think ive only had 2 or 3 in the last 40yrs... LOL. but, also, some have shriveled up. Very few have fallen off so far, and most are a yellow to yellow-orange color. i dont know if they are just not ripening properly ? if this will get better as the tree matures ? - its 5yrs and a decent size tree already. i have 4 trees total. - 2 have new grafts. we had temps in the low 20s, and there was ice on lake pontchartrain so thick i walked on it. it stayed in the mid to upper 20s for a couple of days though. so, i am going out to buy 4 heaters and extension cords. i plan on putting boiling water in a 5 gal bucket for the 2 Jabo in ground. a heater for the Ingao, baobob, green sapote, and mango. i may be changing hobbies in spring depending on what comes back. i did just order a couple of Pawpaw, a Che, and blueberries. i can wake around 6 and try to curtail the damage. should i use a hose and water stuff down at 7am ? and my history of viewing mango trees with fruit is very limited. a block over, maybe it was more than 1 tree ?? 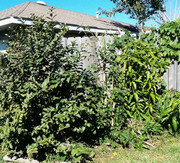 Tropical Fruit Discussion / Hog/June plum - Spondis cold tolerance ?? Is one species more tolerant than the others ? which one ? If i get a late frost will i lose all the fruit ? I live in New Orleans, so do not have access to top mangos to taste. outside of Kent, Keitt, Tommy, and Ataulfo, ive only had a few, and it was years ago. Obviously taste is also important, but season and production is more so. if it is a very rare variety, it might be hard to get scions. Ataulfo, Kent and 1 other will be the rootstocks. im not sure what the 3rd is, but it might be Florigon ? One is so long and spindly, it is drooping down to the ground. So, i am guessing i should graft as low as possible ? (about it being more rigid) correct ? guess this is one way to do it. and then grafting a couple of varieties to it later. does this look like a harder graft then an approach ?? 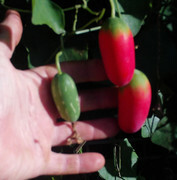 Tropical Fruit Discussion / Katuk fruiting and Tindora (Ivy Gourd/ Coccina) fruits. and i thought my Katuk plant was dead, i had bought 2 more. 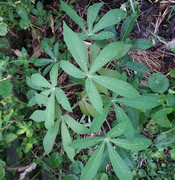 i planted 1 about 15 to 20ft away, and the 3rd around the back of the house. Had i thought i would get fruit, i might have planted it closer. How close do i need it for insects to cross pollinate ? Anyway, i did get 1 lone fruit. THe large plant must have over 200 flowers on it. i can imagine if they all fruited ?? At least now i have a few seeds to play with. However i have no idea if i am eating it at peak ripeness ? though i might cook or stir-fry it if i get lots of them. 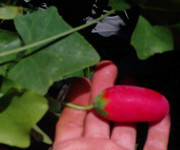 Anyone taste these Ivy Gourd (Coccina Grandis) fruits when red ? i know the Indian store sells them unripe, like little cucumbers. but, they arent bad ripe. fleshy, kinda stringy, but not in a bad way. kinda sweet and a nice mild flavor. but... a very neat video. worms and other soil critters are important !! 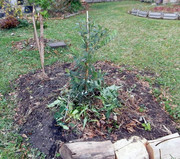 a deep natural mulch layer can create excellent soil. 100lb sacks of coffee grounds, and bags of grass clippings. mixed them up, and used as mulch around the base of my trees. or can pay if its not too much. i would want at least 3 scions of each. and also 1 or 2 of a tasty mango. 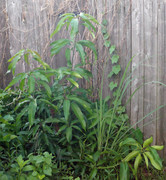 and grew a Mamey from seed about 4 years ago. it was looking pretty nice last fall. and i thought it had bit the dust. so, i hadnt removed the dead plant yet. In the beginning of September, i finally was going to tackle the chore. it was coming back ! 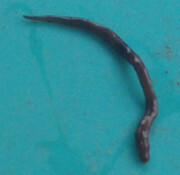 By the way, has anyone ever seen a leech in their yard ? Is this a vector for disease ? i have several things for trade. 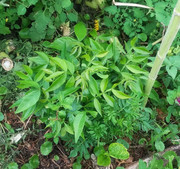 and everbearing dwarf Mulberry cuttings. and only marginal gains, i tried planting several nitrogen fixers near the roots. My understanding is most N chemical fertilizers wash through the soil quickly. With a N fixing plant, i think it acts more like a slow-release. 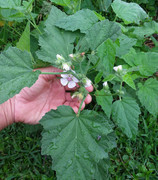 it also does not harm soil bacteria or fungi like chemicals. ive seen a couple of very nice gains. and use liquid fish, worm castings, or compost normally. This seems to be a solution in certain applications for me. maybe bean is better with Plinia and Senna is better with Coffee ? cant find a pic, but these leaves were very yellow. 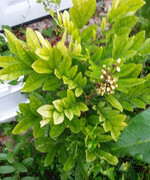 Red Jabo... was chlorotic. Iron and Magnesium had not helped. 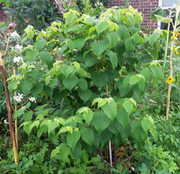 (day was overcast, so pic is yellowish) but leaves are much greener. 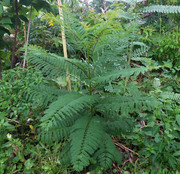 Grumichama hadnt pushed growth in several weeks. 4 bean seeds seemed to help. 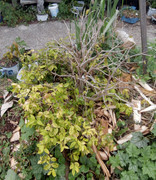 Jabo - pic is from April - after freeze in Jan killed large branches. was not putting out new growth at all. leaf color slowly coming back , still spotty. had to move it from backyard to front. now its holding fruit and growing fine. leaf color is excellent. 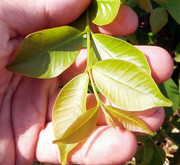 often, i search for this plant, and the leaves look just like regular guava leaves. 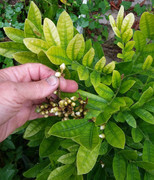 but the plant was named "Angulatum", not " Acutangulum "
Accepted Name: Psidium acutangulum Mart. ex DC. 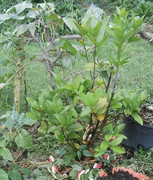 (purple forest guava ) ?? Tropical Fruit Discussion / ID these plants ? leaves look a little like muntingia, but, its not. i searched all over, and cant find much on frost tolerance /zones. anyone have 1st hand knowledge ? It is hardy to zone (UK) 10 and is frost tender. 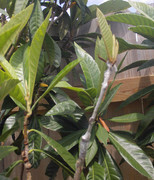 i read conflicting reports as to whethere it needs a second plant for fruit ? 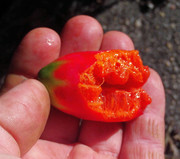 a long fruiting season is a big plus, but, only if the flavor is at least decent.